If you, like Fatz, thought the Vodacom meerkat was pushing the boundaries of tasteless and nauseating advertising, then the recently held ‘My Coke Fest’ in Johannesburg and Cape Town over the Easter weekend would have had you regurgitating your overly-priced hamburger and soft drink. Picture the scene. You arrive at the stadium entrance, your ticket in hand, and you walk through a giant red Coca-Cola archway. Not too bad – at this point, you’ve just got there and are excited to see your favourite band. You make your way over to the food tent, which is large and red and that oh-so-recognisable logo is emblazoned across the entire side of it. You start to get that thirsty sensation in the back of your throat, and a little voice with an American accent in your head tells you, “MMMM MMMM I sure fancies myself a big ol’ swig of cola! Yeehaw!” Luckily, there is more than one option to drink – apart from Coca-Cola, the vendors can sell you ANYTHING else you want …as long as it’s owned by Coca Cola. And if it’s a beer you are after, which of course is not owned by Coke, they send you to the reject tent in the furthermost corner, and make you queue in excess of two hours before you get your order. 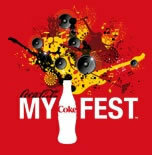 YOUR Coke Fest, you say? Fine – you can keep it.